Read below to discover London’s most luxurious venues for gala dinners. Plus, find out why Ultimate Experience is one of the city’s favourite events management providers. A gala is your opportunity to make a great statement and give your clients their best party this year. And with Ultimate Experience, a leading events management company owned by the prestigious Concerto Group, a collection of 16 trusted brands, we’ll make sure your event is a huge success. Choose your entertainment and cuisine, and customise the decor according to your brand. This is your chance to reward your clients and celebrate your company’s latest success. 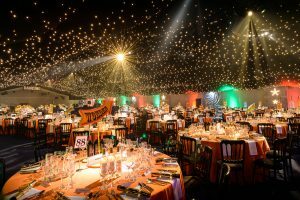 With a capacity of up to 2,400 guests for receptions and buffets, the Artillery Garden at the HAC, EC1, is one of Ultimate Experience’s largest and most prestigious corporate venues. That makes it a particularly suitable choice for gala dinners, and you can expect first-rate cuisine with the Concerto Group’s Create Food & Party design, one of the UK’s leading catering firms. The are few venues in London, if not the whole of Britain, with the splendour and prestige of The Pavilion at the Tower of London. It’s overlooked as one of the most iconic castles in the world. Built for William the Conqueror in the 11th century, it’s still the home of the Royal Family’s Crown Jewels. The Pavilion was purpose-built to serve as a world-class entertainment space. It can be hired for summer galas in its beautiful gardens or winter galas with a magical frozen wonderland theme. This Grade II-Listed venue in Chalk Farm near the revered Camden Market has hosted the BBC Electric Proms. It has therefore welcomed many famous musicians, such as The Rolling Stones, Bob Dylan, Blondie and David Bowie. Hire the huge Main Space, a 1,300-square-metre blank canvas space that can accommodate up to 1,000 diners, and benefit from the support of a dedicated events team. As an independent charity, all income the Roundhouse receives goes towards supporting disadvantaged young people. The Roundhouse is invested in community partnerships, schools, open access projects and career progression. Finally, the Old Billingsgate is another renowned London landmark. It began life as the Billingsgate Fish Market in the 19th century, which was the largest in the world. Today, it’s one of London’s most versatile events spaces, with 80,000 square feet of space that can be hired for high-profile galas. 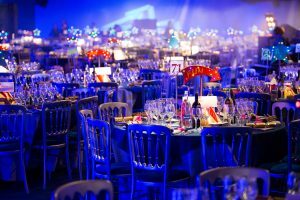 Like all of our other venues, you’ll benefit from excellent suppliers, with top catering firms like Create Food Party and Design, renowned lighting/sound suppliers like TrueTec Services, and more.